Friday started with another red sky morning. A few days ago the red morning sky was followed by fast moving and unsettled weather, but nothing serous. The move this morning will not take too long so I ate breakfast and packed at an easy pace. By 9:00 AM Lightning Lake had been left behind. A few logs had to be cut off the old portage leading around a rapids to the long creek channel. Another tree laying across the channel was trimmed and gone under in Limbo style. 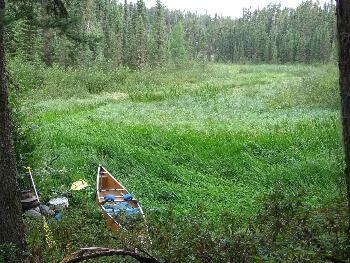 It took 30 minutes to reach the old beaver dam, 25 minutes to portage along the edge of the marsh-lined creek to where a good open channel reappeared and eight more minutes to reach the open lake. It was the easiest navigation I have ever had on a tiny creek in WCPP. Upon entering the lake I was not very impressed with what I saw. The contour lines had painted a much grander picture in my mind than what I was seeing. Thinking of changing my plans for a stay on the lake I headed around a corner and into a narrow section of the lake. What I saw had me looking for a camp spot with a view of the grandeur. 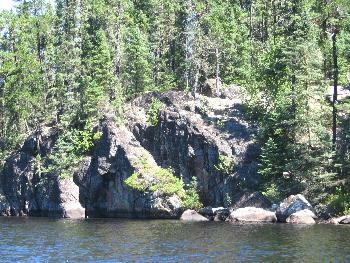 High walls of lightly forested rock would provide great looks deep into the timber. A site on the north shore provided all that I was looking for, a great view. There had to be a spot for a tent up there somewhere. Camp went up quickly, including the tarp under the blue skies. The fishing pole was rigged and a troll for lunch started when there was a sudden change in the weather. It clouded over and a thunderstorm cell passed to the north. Concentrating on my fishing and admiring the surroundings caused me not to realize how it had calmed. Too calm! Looking up to a black cloud hanging overhead I headed for shore as fast as I could, expecting a bolt of lightning any second. I could then hear a roar but the treetops showed no signs of a breeze. As I landed the huge raindrops fell from the sky. 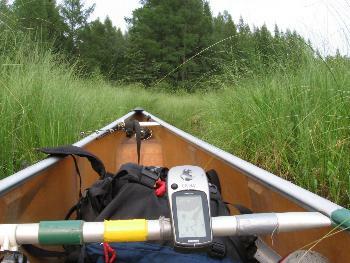 The canoe was flipped and tied down before a mad dash to my camp high on the hill. A deluge of rain then moved noisily over the lake. The roar was the heavy rain hitting the quiet forest. The pail I always carry was used in a new manner, a rain barrel. With the lake far below and all that fresh water pouring off the tarp it was the obvious thing to do. Rice and Beans were simmering when floatplanes taking off to the west told me that better weather was on the way. A half a mug of coffee later the sun is out and drying things off. It would not have mattered to me if it had rained all day. I am sitting amongst the best scenery in the park. There is so much to do here that tomorrow will be another layover day. 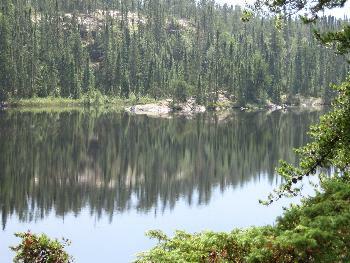 Part of the reason that I am stalling is because that one more portage will put me on trails that I have walked before. The afternoon was spent trimming a path to the next lake and throwing logs off an old portage I will use to get to what I call “Poodle Lake.” I think it looks like a poodle lying on it back with legs splayed and tail trimmed like a poodle. 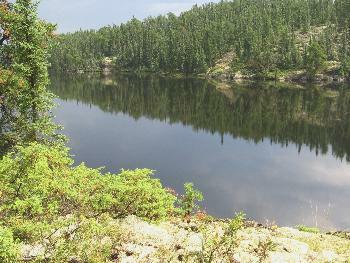 A portage north from “Poodle Lake” puts me on the Royd to Murdock chain of lakes. 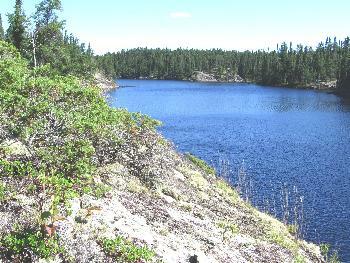 From there I will revisit the lost portages of Irvine Lake that are in my 2005 journal by that name. As for Royd Creek, I know that I will return to its fantastic bluffs in the coming years. 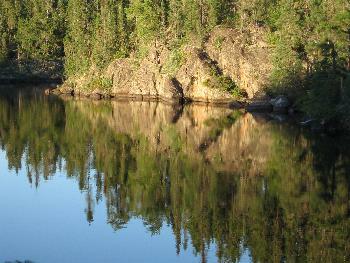 After studying the maps I find it doubtful that I would come up or go down that creek from Joey Lake. Unless you are coming from Indian House Lake it makes no sense. Whether you use the muddy creek or the pristine Royd Creek corridor you still end up on Gammon Lake. An in and out on Royd Creek seems like the best way to enjoy these wonderful waters. Royd Creek has better scenery, more solitude and is a lot easier. There was lightning in the night and by 7:00am the thunder rumbled nearby. As the breakfast water boiled the clouds overhead moved in different directions. Low clouds raced south and then a brief strong east wind blew and the low clouds raced back north. Eventually any brightness in the sky was covered over and a dark thunderstorm loosed a torrential downpour. Fortunately it blew from the NW and the high hill behind me prevented any rain from blowing under my tarp. By 10:00 the blue skies were back and the wind settled its wars and came hard from the west. A hike back over the trapper’s one-mile trail took up most of the afternoon. Exploring the rough country along the route revealed how expertly it had been chosen as the best way for a trail through it for the trap line. It is Sunday morning and the sun is shining bright. Time to move on to the lost portages of Irvine Lake. They may not be lost for too much longer as the park has plans to clear and open them back up in 2008. It has been so nice here on Royd Creek. Two days hardly does the area justice. I am in no hurry to leave so any excuse is being used to prolong leaving camp. There are only 11 days of food and fuel left so things are combined to allow a two trip portage instead of the three needed until now. The tarp is still a little wet and the coffee mug is not empty and that is reason enough to sit back and relax a while longer on my lookout over the lake. When the mug runs dry it is time to pull a Calvin and Hobbs and lose a shoe so as to stall leaving until a little longer. When I finally make the portage over to the fifth lake east of Royd an Osprey is hunting the lake. My route takes me away from Royd Creek as I head north on the old portage to “Poodle Lake.” A Broad-winged Hawk lands close to me and does not fly away. It is a trait of this hawk to let people approach quite close without flying away. 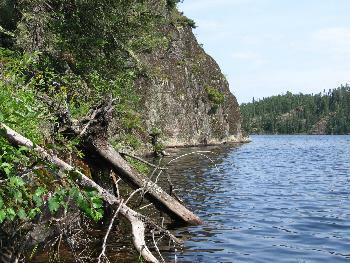 Paddling slowly up the beautiful passage of “Poodle Lake” prompted me to do a count of my remaining days. It showed there were some days to spare and then it was only a matter of picking out which of the plentiful camp spots to use. A bath and laundry are on the agenda so a sunny exposure out of the cool wind wins out. The ragged shoreline adds a lot of character to this lake. The low hills with their sparse timber look like a great place for some hiking. As my clothes dried on the line I read through some more of my bible and studied the topo maps to see if I could find a better route to the next lake than the one I used before. The old route goes through a soft and spongy area that made for tough portaging. A route on the east side seems to be the best choice as the west side appears to me to steep for a portage. Sometimes routes can be plotted ahead of time but in this case the actual lay of the land showed that it was not a good choice. At the north end of the attempt I crossed over the low area connecting the two lakes and found the steep walls that the too map indicated would be there. 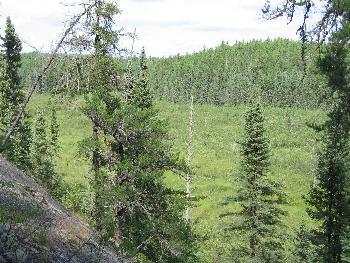 Staying on the low ground and heading back toward my canoe on “Poodle” I came upon an animal trail heading up a ravine to higher ground. Once on top the going was great and there was even a gentle descent to my canoe. Realizing this was a good route I headed back the other way to tweak it a little more. 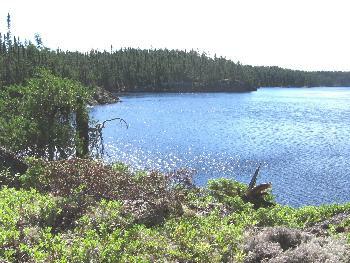 Instead of heading down the animal trail to the low area I ventured around the backside of a high rock and stayed up high until I was near the other lake. There I was able to find a suitable trail back down to the waters edge. There are natural switchbacks that allow a safe walk up or down. What looked to be impossible turned into a great route between the lakes. It is one of those portages that offer a great look at the other attraction of WCPP. An opportunity to view beautiful woods with sun dappled lichen covered rock openings. 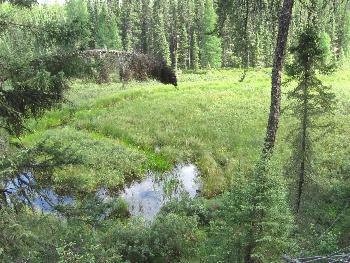 Time was taken to venture off the trail and soak in the peaceful surroundings while munching the abundant blueberries. More time was taken to throw the logs off the trail and scuff the moss enough that I can retrace it when I leave “Poodle” tomorrow. Next on the day’s activities was a cruise up and down all of the poodle’s legs. It showed them all to be rugged and pretty. In a few spots short hikes were taken up into the woods to explore. Late in the evening I was alternately reading and using my binoculars to search the opposite shoreline for wildlife when wood cracking alerted me to something happening. Soon a Black Bear appeared a ways down the other shore. The disturbing part is that it was heading in my direction like it was on a mission. It disappeared into a small bay but I could still hear it moving for quite some time. It never did appear across the narrow passage but noises over there kept me on full alert. It then came to me that the bear was running away from an area I had been hiking in a few hours earlier. I headed to my sleeping bag feeling relieved that the bear was running away from my scent and not towards the Tuna Helper I cooked for supper. Two pans to use as noisemakers were still taken inside the tent to be used if there were any noises during night.